Alarm, Alarm! In Firecreek, Bill Butcher’s favorite sausage is in flames. It’s time for Fred Fire chief and his four fire fighters to get moving. Unfortunately, two of the fire fighters overslept…but there’s no time to lose. The fire fighter who puts out the most fires, collecting cards to build the longest street wins the game and is the best fire fighter in the city. 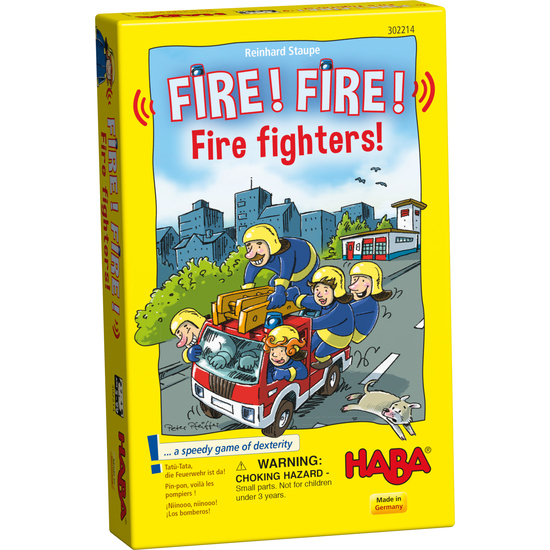 Contents: 4 fire trucks, 4 beacons, 4 fire fighting crews, 10 slow burner cards, 16 site cards, 10 operation cards (printed on both sides, for beginners and for advanced), 1 set of game instructions.